Many pounds of raw peanuts in mesh bags. What is a good recipe for boiling 50 pounds of peanuts? Thank you for the help. Whether you are boiling 50 pounds, 5 pounds, or 0.5 pounds of peanuts, the traditional recipe is the same: water, salt, and raw peanuts. The amount of salt required is not a matter of the pounds of peanuts being boiled, but rather the number of gallons of water used to first fill the pot. You will have to add fresh water as it boils away. As a starting point we suggest using 1/2 cup of salt per gallon of water initially used when filling the pot at the beginning of the boil. You can always add more salt after the peanuts have softened from boiling, and have soaked in the cooling brine. It is easier to add more salt later than to try to reduce the salty flavor if you add too much salt early in the process. Peanuts cannot absorb the salty flavor from the brine until they first soften from boiling, and begin to get wet inside the shells. Green raw peanuts must be boiled for at least 1 hour, up to 4 hours. Dried raw peanuts must boil for more than 8 hours, up to 24 hours or more in an open pot. If you like spicy boiled peanuts take a look at these great Cajun boiled peanuts recipes. If you intend to boil 50 pounds of peanuts at one time, in one pot, you are going to need a huge pot. You might want to try boiling a pound or two at first to understand the time required to reach the softness you like, and to fine tune your recipe for boiling large amounts of peanuts at one time. The amount of salt and spices you need will scale with the amount of water you use when first filling the pot with peanuts and water. For safety sake, don't leave a pot of boiling peanuts unattended. If you have to walk away, turn off the burner until you return. Let the boiled peanut soak in the cooling brine for an hour or more to maximize the juicy flavor. Good luck, and please tell us about your peanut boiling experience! 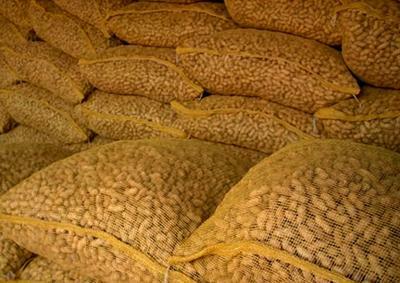 Where do you buy your peanuts? No need to work that long.